A vacant lot, rat-infested and filled with garbage, looked like no place for a garden. Especially to a neighborhood of strangers where no one seems to care. Until one day, a young girl clears a small space and digs into the hard-packed soil to plant her precious bean seeds. Suddenly, the soil holds promise: To Curtis, who believes he can win back Lateesha's heart with a harvest of tomatoes; to Virgil's dad, who seems a fortune to be made from growing lettuce; and even to Mariclea, sixteen and pregnant, wishing she were dead. Thirteen very different voices--old, young, Haitian, Hispanic, tough, haunted, and hopeful tell one amazing story about a garden that transforms a neighborhood. An old man seeking renewal, a young girl connecting to a father she never knew, a pregnant teenager dreading motherhood.Thirteen voices tell one story of the flowering of a vacant city lot into a neighborhood garden. 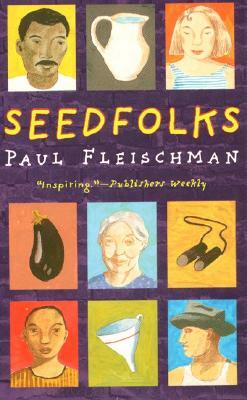 Old, young, Jamaican, Korean, Hispanic, tough, haunted, hopeful'Newbery Medal winner Paul Fleischman weaves characters as diverse as the plants they grow into a rich, multi-layered exploration of how a community is born and nurtured in an urban environment.